August 20 marked an important day for families living with autism; because it marked the first sensory friendly movie shown in Cebu. SM Cares offered children with special needs and their families a chance to experience seeing a film on the big screen -- “Planes: Fire and Rescue”. 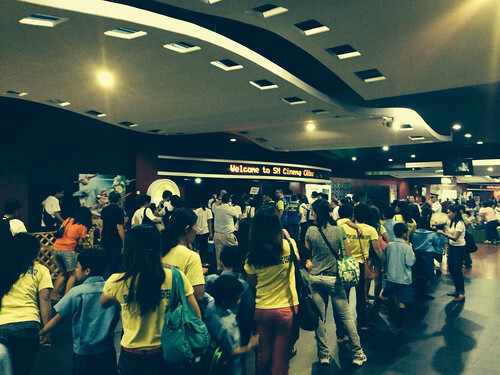 Over 225 special kids from 11 special schools in Cebu lined up in SM Cinema 1 at 8:30am, accompanied by 275 family members, caregivers, volunteers from Velez College PT/OT, Rotary Clubs, and Reach Center staff. The event was overseen by ASP Cebu Chapter President Kathy Castellano and Adviser Sandra Espina. The challenge for children with ASD in coping in the movie theatre, involves potential sensory stimulation overload from the dark environment, the loud sounds, the bright lights and the cold room temperature. However, on that day, SM Cares provided 1) a friendly and acceptable environment for the special kids to get up, move around and even make little noise, 2) warm lighting instead of total darkness, 3) lowered the volume of special effect and music, and 4) less trailers.